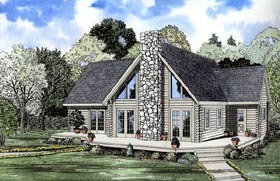 Sun decks and an enormous master suite grace this stunning log home plan. Enter this home through a side kitchen door or one of two sets of French doors leading into the great room. Once inside you?ll appreciate a large dining room with a kitchen fit for a chef. The master suite is located on the main level and is enhanced with a private bathroom with whirlpool tub and large walk-in closet. The rest of the family can retreat upstairs to two large bedrooms with an abundance of storage while enjoying a view to the great room below through a beautifully crafted balcony railing.